Difference between revisions of "Khenpo Palden Sherab"
'''Khenpo Palden Sherab''' ([[Wyl.]] ''mkhan po dpal ldan shes rab'') (b. 1941) is a senior [[khenpo]] of the [[Nyingma]] tradition. 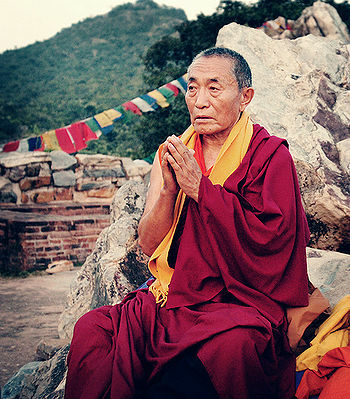 He was born in 1941 in Gyuphu in the Doshul region of East Tibet. He entered [[Riwoche Monastery]] at the age of 12 and completed his studies there just before the Chinese invasion. In exile, in 1967 he was appointed by Kyabje [[Dudjom Rinpoche]] as the head of the Nyingmapa department at the recently formed [[Central Institute of Higher Tibetan Studies]] at [[Sarnath]]. He now teaches in America and throughout the world together with this brother, [[Khenpo Tsewang Dongyal]]. '''Khenpo Palden Sherab''' (Tib. མཁན་པོ་དཔལ་ལྡན་ཤེས་རབ་, [[Wyl.]] ''mkhan po dpal ldan shes rab'') (May 10, 1942 - June 19, 2010) was a senior [[khenpo]] of the [[Nyingma]] tradition. He was born in Gyuphu in the Doshul region of East Tibet. He entered [[Riwoche Monastery]] at the age of 12 and completed his studies there just before the Chinese invasion. In exile, in 1967, he was appointed by Kyabje [[Dudjom Rinpoche]] as the head of the Nyingmapa department at the recently formed [[Central Institute of Higher Tibetan Studies]] at [[Sarnath]]. He taught in America and throughout the world together with this brother, [[Khenpo Tsewang Dongyal]].